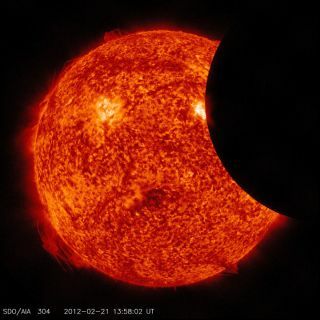 A partial solar eclipse, as observed by NASA's Solar Dynamics Observatory in February 2012. A solar eclipse is scheduled for Friday the 13th, but most skywatchers will be out of luck without doing a bit of traveling. So, perhaps more penguins than people will witness this eclipse. We are now into our second eclipse season of 2018. The eclipse seasons are actually less than six months apart, by about 19 days, so they keep falling back that much earlier each year. Last year, periods when eclipses could occur fell in February and August; this year, they have shifted to January and February, and July and August. Next year, they will have shifted back again, so that one will come in January and the second in July. Near the end of the year (Christmas Day), one eclipse will squeeze in to make a third eclipse season. What is an eclipse season? It is a span of about a month, during which eclipses are possible at the new and full moons, because the line of the nodes of the moon's orbit is pointing near enough to the sun. The moon's orbit is tilted toward Earth's at an angle of just over 5 degrees, and the nodes are the two points at which the planes intersect — that is, at which the moon passes down or up through the plane that Earth revolves around the sun on, called the ecliptic plane. Picture the moon's orbit as a coin held at a slope and remaining in the same orientation as it is carried all the way around the sun. Earth is at the center of the coin; the nodes are the two points on the coin's rim that are on the same ecliptic plane as Earth. If the moon is anywhere else on the rim, it is too high or too low to cast its shadow on Earth. The middle of this summer's eclipse season coincides with a total eclipse of the moon on July 27, and it is so central (the moon will pass almost straight through the middle of Earth's shadow) that we can also have two "marginal" solar eclipses — the first comes two weeks before the lunar one and the other solar eclipse comes two weeks after. Interestingly, the moon will also be very close to Earth during these celestial events; lunar perigee occurs just over 5 hours after new moon. This actually makes Friday's solar eclipse cover a yet smaller area of Earth's surface than it otherwise would, since the penumbra of the moon's shadow (its outer shadow), unlike the umbra, grows broader, the farther it is from the moon. Meanwhile, the moon's umbra, from where the great spectacle of a total eclipse would be seen, passes far beyond Earth, but misses the planet by more than one-third of Earth's radius — for an observer in the Antarctic, that part of the shadow is 1,400 miles (2,200 kilometers) aloft. In short, so far as solar eclipses go, this one is very "underwhelming." Joe Rao serves as an associate at New York's Hayden Planetarium. He writes about astronomy for Natural History magazine, the Farmers' Almanac and other publications, and he is also an on-camera meteorologist for FiOS1 News, Lower Hudson Valley, New York. Follow us @Spacedotcom, Facebook and Google+. Original article on Space.com.